This tutorial shows how to use the Month AJAX component from DayPilot Pro package in a simple ASP.NET MVC project. The current month can be switched using a drop down (select box) with a limited list of months. It preserves browser history by using a hash-style URL navigation. 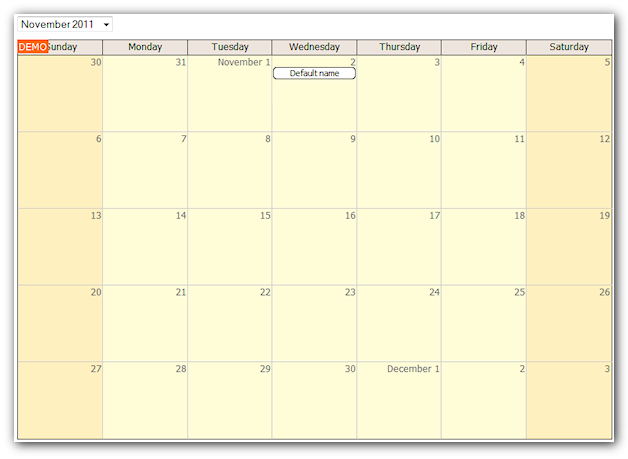 It uses jQuery to glue the generic HTML <select> element with the Month view. Include the Content/DayPilot directory from the DayPilot demo project. Add a simple <select> element with pre-generated list of 15 months. Now bind the change event of the #dropdown element using jQuery. Our handler will fire the Command event, with "navigate" as the command id and the selected date string as the start variable. We need to add the Command handler on the server side (in the MonthController) and change the Month calendar date as requested. A full Update is necessary in order to redraw the Month control in full (and not just the event set). We can extend the jQuery code a little bit to preserve the browser navigation history. The code we have at this moment does an inline change using AJAX calls. With a little more code it will be possible to return to the previously selected month using the back button. First, we change the URL using the hash notation when changing the month. We also need to check the URL for the selected month and preselect the correct value in the drop down list during the initial page load.